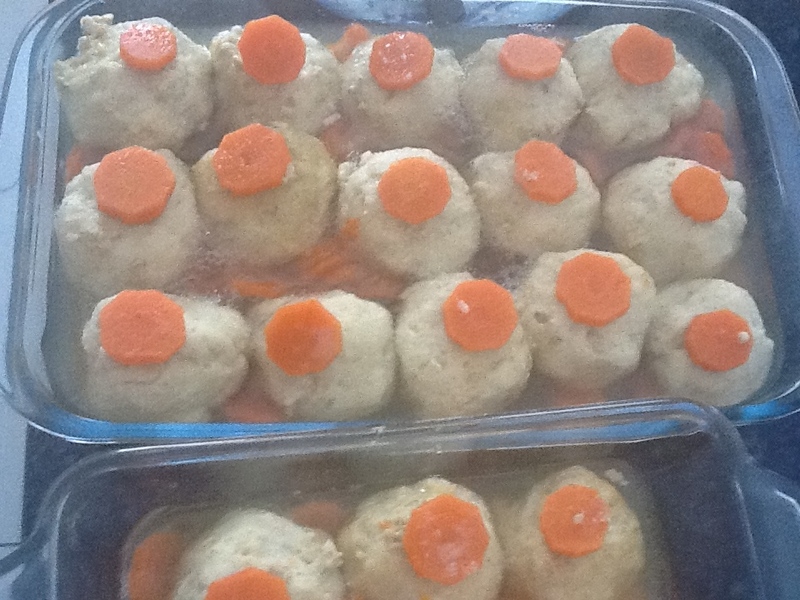 My family love home made gefilte fish. I use 2 kgs minced/ground fish and make half into gefilte and the rest into fried fish balls. When my son was much younger he would not eat carrots so I mince/grind my own fresh fish and add fried onions to the mixture, which makes it sweeter. I hope your family enjoys it as much as mine do. 1. Cut the fish fillets into chuncks. 2. Place a handful of fish into a food processor at a time and grind the fish for a few seconds till the fish is chopped. Repeat until all fish is ground.Remove the fish and place it in a large mixing bowl. 3. Add the fried onions and oil and blend till chopped finely, add this mixture to the fish in the mixing bowl. 4. Add the rest of the ingredients and mix very well. At this stage I taste the fish to check for seasoning…Yes I do like raw minced fish and this step might not be for everyone! 5. Prepare the stock. I still prepare the full amount even though I fry half. 7. Add the rinsed skin, head and bones. 8. Slice 3 onions and add these to the stock, I add the skin of the onion which gives the stock a good colour. 9. Add 1 tsp salt, dash of pepper and 1 tsp sugar. 10. Bring to a boil and simmer for 1 hour. 11. Strain the stock and add 3 peeled and sliced carrots. 13. Cook over gentle heat for 1 1/2 hours. 14. Leave to cool in the pot. 15. Remove the fish balls and place them into a platter dish with sides – pyrex dishes work best. 16. Place a sliced cooked carrot on top of each ball. 17. 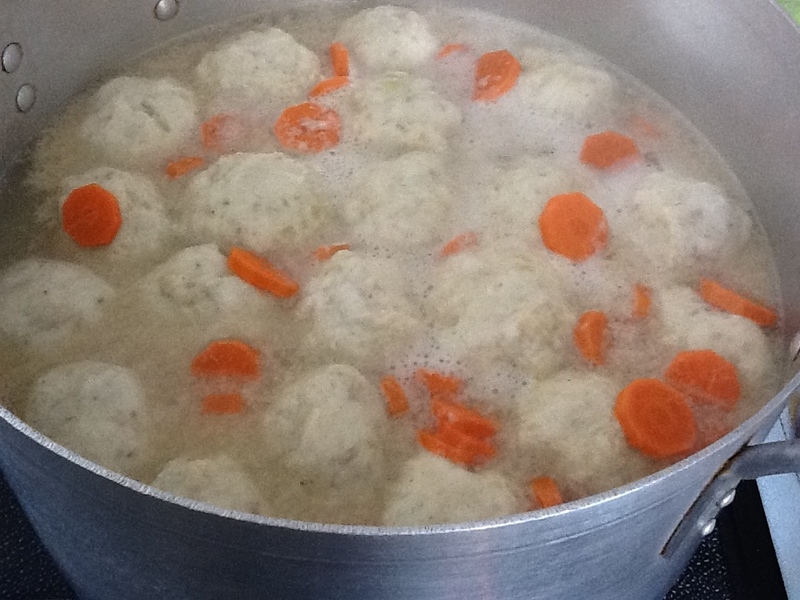 Pour the liquid around the fish balls. It should set into a jelly from the skin, bones and head. 18. Place in the refrigerator. 2. Shape the fish mixture into patties or balls and frytill golden. Chopped herring is very popular and always requested at a function in South Africa. Our local synagogue has a kiddush brocha meal every Shabbat and I make the chopped herring for this. I reckon I make about 15kg a month! You can never have enough. It is usually served with Kichel (recipe here). Chopped herring is served on almost all Jewish Holidays and celebrations. This quantity makes about 2 liters. 8 marie biscuits – any sweet cookie can be used. to make parev i use lady fingers. Slice onions and fry in a little oil until soften be careful not to carmalize them, about 12 minutes. Use a food grinder/mincer on medium (my Kenwood electric mincer has three different discs and I use the middle one). Mince the herring, apples, biscuits/lady fingers, onions and eggs into a large bowl. Once everything has been minced add the sugar, vinegar, lemon juice and cinnamon. Mix well and taste, it should taste sweet and sour. Adjust with additional seasoning as necessary, I sometimes need to add a little more vinegar. Don’t forget that the flavours will develop once the mixture stands for a while. Once the flavour is to your liking cover and place in refrigerator for a few days before serving. This recipe can frozen with great success.